While Apple's recent stock woes have been driven by investor concerns over the company's slowing growth, one analyst believes the current stock price does not reflect the "stickiness" that will cause existing customers to stay with Apple. Chris Whitmore of Deutsche Bank has maintained his "buy" rating for AAPL stock, because he believes existing Apple customers will remain loyal to the company's platform. That means customers are likely to upgrade to new Apple hardware in the future. Whitmore also believes Apple will continue to grow its user base, increasing shareholder value as more customers become tied in to the ecosystem. 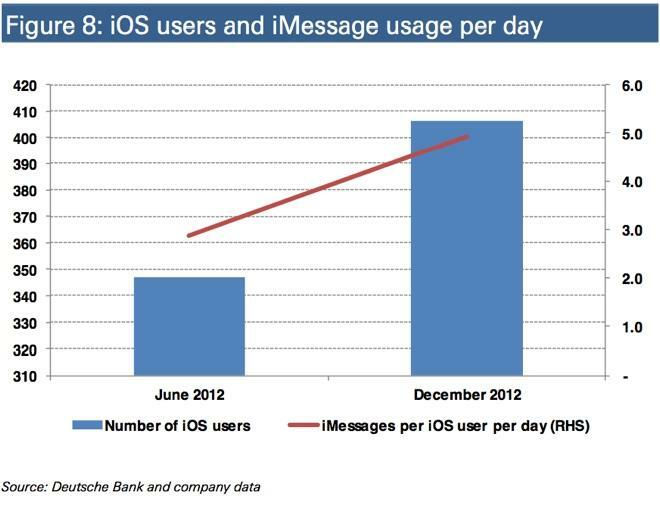 He believes that beyond apps, Apple-only features like iMessage and FaceTime also increase the "stickiness" of iOS. "The key underpinning of this view is the stickiness of the iOS platform and the substantial and growing investment (both time and money) Apple users place in it," he said. "Although the U.S. phone market is well penetrated, we see substantial opportunity for Apple to grow its user base in emerging markets and further monetize existing iOS users through the living room (Apple TV, additional content, etc.)." Cumulative dollars spent on iTunes, accessories and the App Store are at around $54 billion as of the December quarter. That spending is also growing between 20 and 30 percent year over year. Whitmore estimates that there are about 400 million iPhones, iPads and iPod touches in use. With 40 billion cumulative application downloads, he estimates that there are about 100 applications downloaded per device. 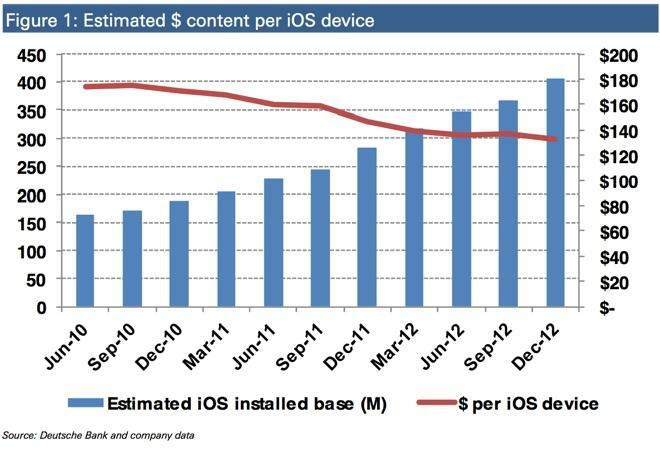 He believes the average iOS device has about $130 in content, including applications and iTunes Store material. "iOS users have made a significant investment in time and dollars into the iOS platform, and as a consequence the switching costs are remarkably high," he said. Deutsche Bank has reiterated its "buy" rating for AAPL stock with a price target of $575.